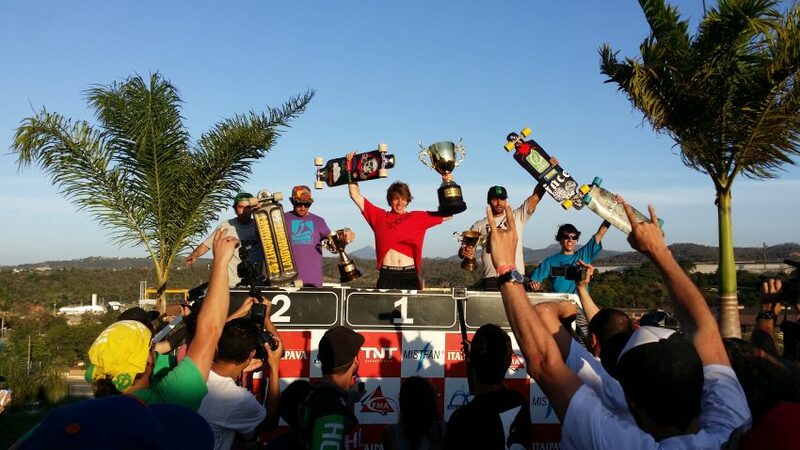 Canadian Kevin Reimer once again showed the world what a clinical skater he is by making it two wins in a row at the Mega Space World Cup event in Belo Horizonte, Brazil. Reimer was pushed all the way by Dillon Stephens who reeled in the current World Cup points leader as the two riders entered the last turn before Reimer shut the door on his countryman with his exit speed carrying him over for another win. 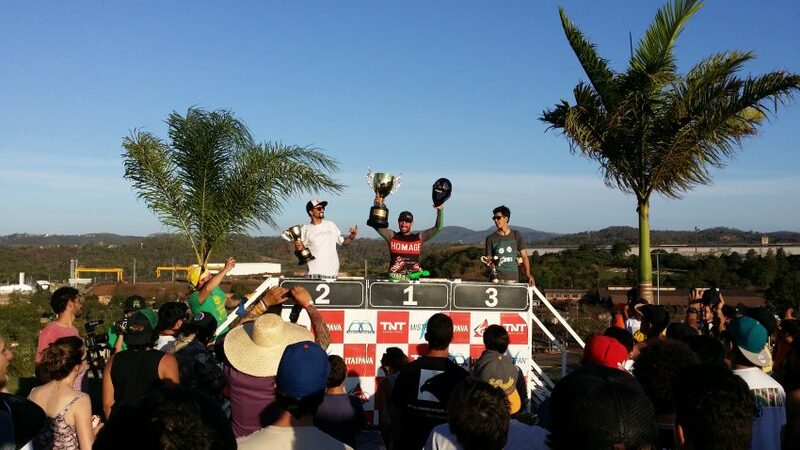 Brazilian Carlos Paixão took third while Thiago Lessa who was extremely fast in the qualifying came in 4th. Open Podium at Mega Space. 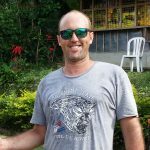 During qualifying In warm conditions Canadian Kevin Reimer had a blistering run to take top spot in Open Skateboard bracket with a time of 1:13.815 only to see Brazilian Thiago Lessa (1:13.835) come within 20 thousandths of a second of eclipsing him in his final run of the day. The Qualifying leadership and top seed spot was a 4 way battle for most of the day with Dillon Stephens (1:14.933) super fast early on and local rider Rato Rodrigo (1:14.790) posting some dominant times. Later in the day Brazilian Jonas Richter climbed up the leader board with a time of 1:14.939 to round out the top 5. Earlier in the day Jonas Richter looked strong winning his first 2 heats comfortably before getting crashed out in the quarter finals while in second position ending his run into the finals prematurely. Carlos Paixão had a clean run of wins all the way to the final showing some serious class before being overcome by Reimer and Stephens in the final. German Sebastian Herlter showed his ability to race through the brackets with a series of second places that took him into the Consi final where he again placed second to take 6th place overall. It was an unlucky day for the German who took a heavy fall in one of the aggressive push offs, he recovered both his board and his composure to take some valuable world cup points. Bianca Fior took top spot in the Women's qualifying with a time of 1:20.704 over Melissa Brogni Da Luz (1:20.743) and Georgia Bontorin (1:22.105) that had a familiar ring to it looking at the podium as Bianca took that form into the winners circle that was hard fought across a series of points races. Women's Podium at Mega Space. 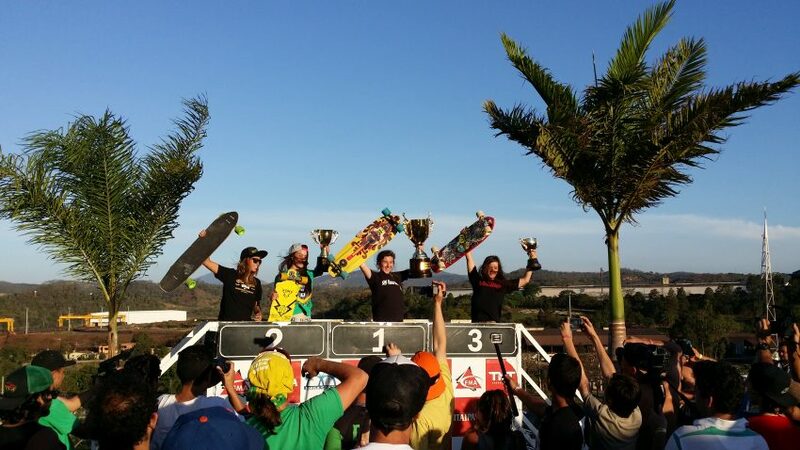 The Juniors category was fought like a game of street football with local riders battling tooth and nail in every heat until Weyder Nascimento scraped through for the win in the final over Pedro Braga and Rodrigo Belli with Cristian Henz taking 4th. 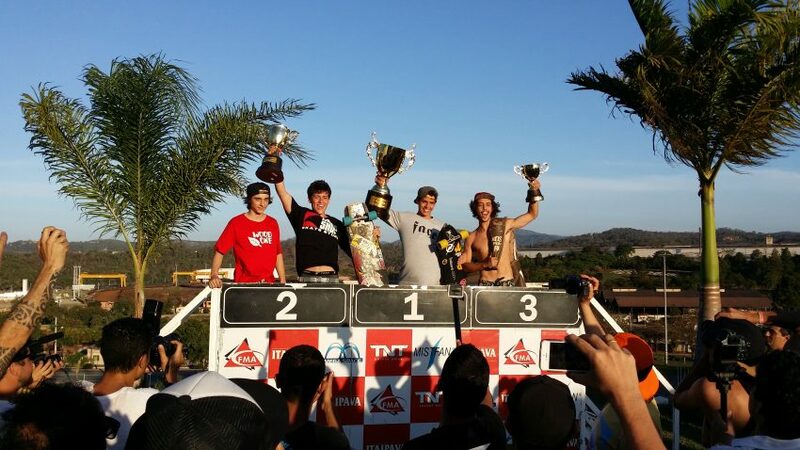 That famous Brazilian passion rang strong throughout the bracket with riders not giving an inch from heat 1 to the final, every corner was contested, straights were bunched and the start line was aggressive. The crowd loved the action with huge cheers as each rider made their way through the heats. Top qualifier Otacilio Costa was unlucky to get knocked out in the semi finals before winning the consi to take 5th. Junior's Podium at Mega Space. In the Street Luge American David Dean made it 2 in a row with a clean points win over his main rival Brazilian Leo Adriano Borton as Fernando Rocha took the lat spot on the podium holding off fast finishing Austrian Konstantin Weigl who did well to finish 4th competing on his Classic Luge throughout the event. Street Luge Podium at Mega Space.